This item cannot be shipped overnight/express. 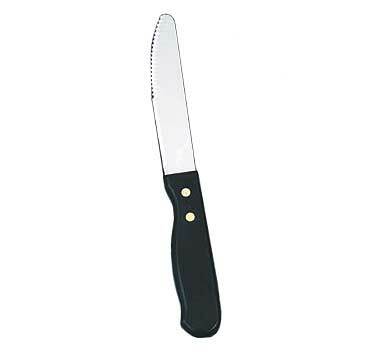 The American Metalcraft large-style steak knife is a quality product that will stand up to heavy commercial use. It has a plastic handle and stainless steel blade that will survive longer through dishwashers. Made in the style of steakhouse knives but without the wood handle, which tends to wear down when repeatedly run through dishwashers. One dozen.